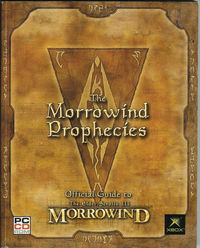 The Morrowind Prophecies is the official strategy guide for TES III: Morrowind, written by Peter Olafson and published by Bethesda Softworks. Traditionally, strategy guides were outsourced to third party companies such as Prima Games, however, Bethesda decided to publish the guide in-house with the help of game journalist Pete Olafson. 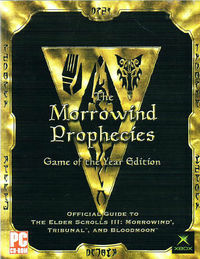 There are two editions of the guide; the original covers only Morrowind, while the Game of the Year edition has new sections on its expansion packs, Tribunal and Bloodmoon. A digital scan of the GotY edition comes with the GOG release of Morrowind. The first chapter outlines the specifics of race and their related attribute and skill bonuses. The character generation process is also discussed, specifically the Q&A option and how each question affects the outcome. You will also find tables listing most of the armor and weapons found in the game and their related stats like health, damage, weight and value. Finally, alchemical ingredients and their derivative effects are also outlined in table form. The second chapter lists the fauna of Morrowind, complete with health, magicka and fatigue, level, spells, attacks, descriptions and images. The third chapter consists of maps and lists of locations. The book breaks up Morrowind into eighteen sections with large overviews annotated with numbers that correspond with a list of locations that accompany it and descriptions of those areas. The fourth chapter gives walkthroughs and descriptions of the main quest. The fifth chapter contains walkthroughs for each of the following factions: House Hlaalu, House Redoran, House Telvanni, Fighters Guild, Mages Guild, Thieves Guild, Imperial Legion, Imperial Cult, Tribunal Temple, and Morag Tong. The chapter also includes faction reaction tables and advancement charts. The sixth chapter contains walkthroughs and descriptions of Morrowind's side quests. Approximately ninety-three pages of the guide are devoted to chapters on Tribunal. Approximately seventy-seven pages of the guide are devoted to chapters on Bloodmoon. This chapter contains maps, information on new creatures, and tables for certain item data. The eighth chapter contains walkthroughs for all quests in Tribunal, as well as generic information on certain underground areas. This chapter contains maps and locations, and splits the island of Solstheim into four sections. It also has information on new creatures and tables for certain item data. The final chapter contains walkthroughs for all quests in Bloodmoon, as well as some miscellaneous information about the island. This page was last modified on 5 March 2019, at 08:09.